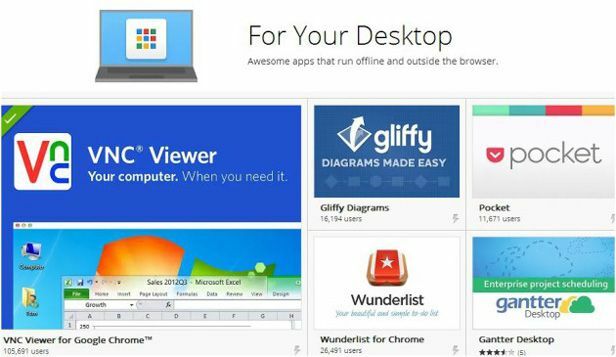 Google has taken another step forward with its Chrome App Store in celebration of the recent fifth anniversary of its browser. Till now, this online marketplace just held apps and browser add-ons. Now the new Chrome App category has just been released where you can download games and programs to use offline and launch them totally independently of the browser, using instead an external application launcher. In the hours after its release the list of available programs immediately began to expand, now reaching more than thirty apps that run the gamut from management programs like the remote-desktop tool VNC Viewer or the note-taking app Google Keep to well-known freeware games like Spelunky. Once you’ve installed one of these programs for the first time, an icon will be placed on your Windows start bar to give you direct access to a menu where you can launch your apps (in addition to the web apps you already had installed in Chrome). These apps run on the desktop and won’t open your browser, but they still use Chrome’s code, so it’s not recommended to launch them without using Chrome as your default browser. Besides how practical it is to be able to use these apps without an Internet connection, they are also capable of interacting with external devices via USB or Bluetooth, as well as sending desktop notifications and interacting with documents stored in the cloud using Google Drive. All this on top of the obvious performance improvement with respect to running and closing programs without fully loading the browser. At the moment it’s only possible to run Chrome Apps in Windows (or if you have a Chromebook), but the official Chrome development blog confirms that the apps will also be available “soon” for Mac and Linux.